A coffee shop owner is defending himself and his business after he claims a hacker posted an anti-Semitic message on his Facebook page, which called Jews "animals" and blamed them for the rise of Hitler. Michael Palombo, the owner of V Roast Bistro in Albuquerque, New Mexico, told KOB 4 that he was first alerted to the offensive post by a friend. "A friend of mine called and let me know that people were slandering the business and myself online," he told the outlet. The post, which has since been deleted, was shared on Reddit and other forms of social media and has inspired many to leave negative reviews on his business’s Google and Yelp page. 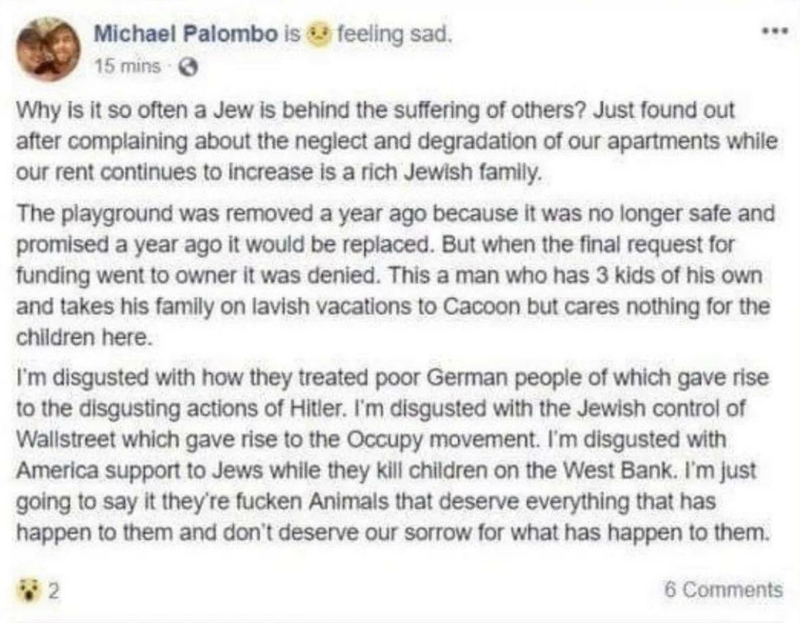 “Why is it so often a Jew is behind the suffering of others?” the deleted Facebook post read, along with identifying Palombo's landlord as Jewish. "All I can say is it wasn't me. It was a hack. Somebody very vindictive, obviously," Palombo told KOB 4. However, Palombo's previous posts have aroused suspicion about an alleged hacker. The business owner frequently shares his political opinion, including that of Israel. "I haven't spoken out against Jews but I've spoken out against Israel and their occupation of Palestine," he said. Palombo went on to tell KRQE News 13, "Somebody did their research, did a good job of pretending to be me." He admits that, due to the negative reviews being left online of his bistro, he will lose his livelihood. While he does not know why the a hacker targeted him, he theorizes, "I'm anti-Trump and vegan so there's a lot of reasons to hate me."